Classic racing cars and more in this book of old transfers by Philmar. Homepage. This page: A children's book of transfers, featuring various modes of high-speed transport. 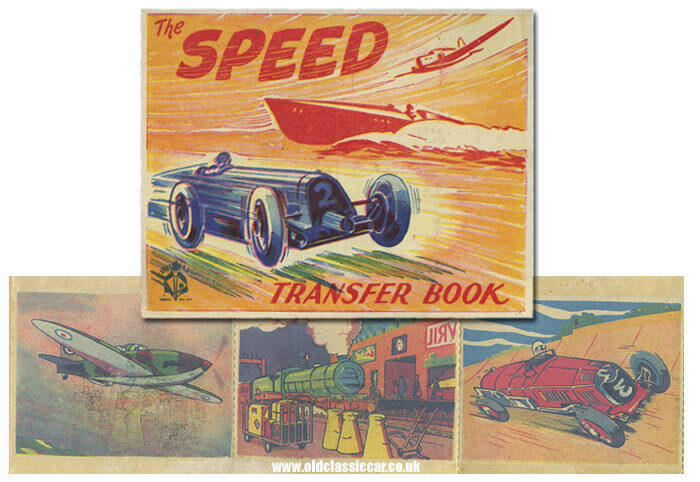 Probably dating to the 1940s, this great little book of transfers features a racing car at high speed, a powerboat and a twin-engined aeroplane on its cover. It was published by Philmar Ltd, of London and Letchworth. Within its pages are several transfers, joined together, that can be removed individually and affixed to whatever surface the excited young (or not-so-young!) person chose. They'd simply cut out a transfer, float it picture-side-up in a saucer of water for a few moments, then withdraw it before sliding the image onto the awaiting surface. How any child resisted chopping up this book of transfers I'll never know - but I'm glad they did! Other goodies similar to this can be found in the Motoring Collectables section of the site.